The Official Research (and Questing, Unofficially) Expedition wants *YOU*! We are about to embark on an epic, all-gnome, in-character run through the new leveling experience - featuring all of the best gnome-based content World of Warcraft has to offer - and we want you to join us. That's right, we're going to roll new Gnomes and level from 1 to 110 as a group! This will be a RP event and should be quite friendly to new RPers! (I'm 100% new to RP, after all, and will be learning from the more experienced G4 members as we go). The current plan is every Tuesday Saturday night from 7:30pm to 9:30pm server time (aka Pacific). That was the time that worked best when we started planning this out, but there's nothing saying we can't change that - get in contact with me if you'd like to propose a new time! The first event will be January 27th. Meet us in New Tinkertown with your freshly rolled gnome and be in character! At it's core, this is a social event - we're not powerleveling, but 'looms are totally allowed. We'll be primarily focused on questing with some dungeons sprinkled in (we'll figure out the grouping for dungeons as we go). We encourage our fellow gnomes to jump in, even if it's "late". At just ~2 hours every week, we're going to be taking this quite slow. If you didn't make the first (or first several) "episodes", don't feel that you can't catch up! We'll work you into the story! And the new level scaling should make catching up with us a breeze - just do a little leveling between each week's "official" event time and you'll be on-par in no time! Already have an in-progress gnome? You can either join us early or watch our progress and jump in when we get near your level. And most of all: absolutely no pressure. This is for fun - 100%. Can't stay the whole time? Only able to make it sporadically? Rather work on something with your main this week? No problem - lets work it into the story and just have fun with it. Camaraderie, plain and simple. We've all been through the leveling experience (and/or the dungeoneering experience) dozens of times, but we haven't... er... Why are you looking at me like that? Oh! You meant "Why?" as in, "Why are a group of gnomes traveling the world? What's the impetus of our RP story?" Well, the loose idea is that we're a group of scientists, engineers, researchers, and support staff that are working with Chromie to discover why certain subterranean caverns, a.k.a. "dungeons", are stuck in what appears to be infinite time loops - events playing out the same way over and over. After cutting our teeth with some field work in New Tinkertown and the surrounding area, we'll be setting out in earnest - trying to puzzle out this temporal quandary whilst also seeking out gnomish populations from the Abyssal Depths to Zangarmarsh and offering our services. Well, you, we hope! Come, join the T.O.R.Q.U.E Squad and together we'll spread the word of gnomish excellence far and wide across Azeroth and beyond! Dr. Ozsker Lightorque duty is to ensure that the safety and health of the squad is maintained to a level that allows for unhindered research in the recent observation of unknown time loops present throughout all of Azeroth and beyond. Dr. Lightorque is up for the long and challenging endeavor ahead. Hey Yz! Sorry that I was away for the final planning for this, I had a lot of things come up. I understand that it may not be changeable, but due to the time zone I'm in, times after 6:30 are definitely not doable for me. Weekends are always much better than week days for me, but I'm usually on around 11:30am - around 6:00pm server time on week days. (Almost all day on weekends) Again, don't change the time if it doesn't work with the other gnomes, but a change in the times/dates would be awesome!! Everyone, please note the day/time change! The all-gnome, IC, leveling group was short but fun tonight! We helped out at Amberstill Ranch, Gol'Bolar Quarry, and Helms Bed lake and made it to the level 13-14ish range. The story continues next Saturday at 7:30pm server time! If you would like to join the TORQUE Squad's story in progress, just level a gnome up to 13/14 and be at the camp just North of Helm's Bed in Dun Morogh for the start of the next event! In tonight's episode: Unbeknownst to their squad mates Chansi (aka ßlissy) and Cogsail (aka Magik / Shield / Tiny / Gear) who were infirmed from ingesting the foul waters of Helm's Bed, Lolly (myself) and Dvu (aka Aizi) launched a spirited counter-espionage campaign against the Dark Iron in eastern Dun Morogh. After a covert infiltration of the spies' camp, the assassination of Dark Iron Captain Beld, and the subsequent acquisition of their invasion plans, Lolly and Dvu were harried half-way 'round the frozen perimeter of Helm's Bed when who should come to their rescue but the Gnomish hero and renowned warlock Forbidra! 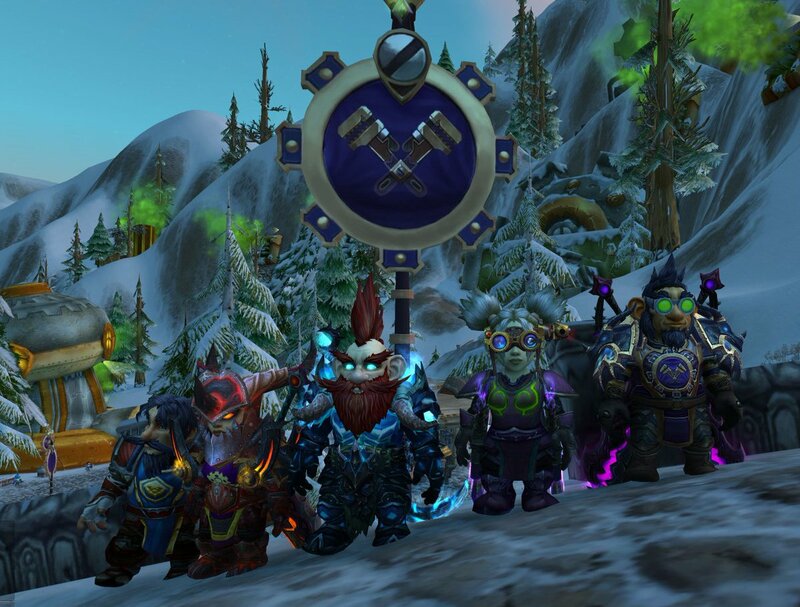 After some mana biscuits and pleasant conversation by campfire light, Forbs bid TORQUE Squad farewell, and the final campaign against the Dark Iron invasion force began. Lolly and Dvu, working under the esteemed Commander Stonebreaker, rallied the Dwarf/Gnome joint task force and blew the invaders clean off the map! Tune in next week, Saturday February 17th at 7:30pm server time, when TORQUE Squad - under the direction of the Council of Three Hammers - will root out the last vestiges of this threat to the Dwarven and Gnomish homelands once and for all. After facilitating a quick series of sting operations ending the spy threat in Ironforge, our squad - Lolly, Dvu, Cogsail, and Blissy - got wind from one of the Council's elite guard that the Explorer's League had also been having trouble with the Dark Iron. The Squad, seeing an opportunity to gain influence with one of Azeroth's most recognized research groups, set out immediately for Loch Modan. - Lolly will do anything for adventure and glory. - Cogsail will do anything for gold. - Dvu will do anything to provoke the local wildlife. - Chansi will do anything, as long as it isn't too dangerous. Arriving in Thelsamar, TORQUE followed up on a tip regarding a fleeing Dark Iron spy holed up in a cave in the hills. The squad quickly apprehended the spy and, in tossing his lair, found a journal detailing the locations of six stolen top secret Explorer's League documents. A) Further future contracting work with the League for TORQUE. However, before the group could properly set out on this expedition, they came face-to-face with something none of them had encountered before: a pale purple elf sporting deep purple hair with tentacles in it. Immediately on alert, our heroes set to interrogating the elf. "Silvermoon!? That's a Horde city!" "Give us one good reason we shouldn't slag you right here..."
"Can I touch your hair tentacles?" Eventually, the squad came to learn that she was a new species of elf - Void Elf, to be exact - recently pledged to the Alliance. Dvu - particularly heart broken - eventually left the newfound ally behind so that TORQUE could get back to the task at hand. In short, the mission was an unmitigated success. All six of the documents were recovered intact and returned to the Explorer's League. Foes were slain, bonds were created, and gold (well... silver) was made. The squad returned to Thelsamar, triumphant but tired, and checked in at the Stoutlager Inn for some much needed and deserved RnR. It was a short episode last night, but still eventful! After last week's exploits on behalf of the Explorer's League, word came to the squad that their assistance was requested out at the Farstrider Lodge, so Dvu and Lolly struck out immediately across the southern end of the lake. However, with the Lodge just coming into view, Dvu picked up a distress signal from the vicinity of Silver Stream Mine. Heading the call, TORQUE Squad hearth'd back to Stoutlager and quickly headed north. Arriving at the mine, the squad found that the originator of the call was a fellow gnome mage named Jillenie, and the reason for the call was immediately evident - Kobolds had beaten a whole tribe of Troggs into submission and were pillaging the mine! However, where one gnome had failed, three succeeded - the Kobolds and their Gnoll task master were cleared out of the mine. For now, at least. Dvu and Lolly decided to continue their journey to Farstrider Lodge, this time going around the northern end of the lake. Along the way, they ran into a much needed gnomish engineering trainer, an apparently catatonic gnome (having survived what was apparently a very recent plane crash), and a lot of nature's dangers (thanks to Dvu's out of control imp "Demon-Thing").